Obito disguised as Masked Man @ Tobi in Naruto series. However, everyone had a misconception that Uchiha Madara was the one behind the mask. Obito take control of Akatsuki to gather all the Tailed Beast to perform Infinite Tsukuyomi. Although it was quite a surprise to see him alive, it was an excellent twist in the series. 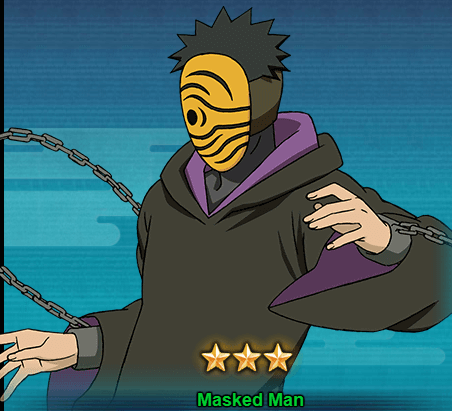 Let’s take a look at the Masked Man’s abilities in Naruto Online game. Ninjutsu Kamui – Absorption [Prompt]: Causes damage to a selected target and Immobile, this skill will cancel the selected target’s Shields and Buffs. A unit defeated by this skill cannot be revived. Taijutsu Warp Attack: Attacks the opponent’s unit in the front row and has a high chance of causing Repulse. Taijutsu Suppressing Lock: Chases and Attacks Repulsed unit, causes Immobile and Low Float. Ignores a given amount of Defense and Resistance. Ninjutsu Evading Skill: Very High Chances of evading the Mystery Skills, Standard Attacks or Chase skills suffered by this unit. Can be triggered once each round.